Here we have four young ladies who don’t have to walk far distances for dirty water. I don’t know if they are going to school, but their chances, because they are using less time and energy to fill and carry those jerrycans, are greater. Franco has also planted 13 mango trees! Here is a mango sapling, encircled by a fence of sticks, planted near one of the center’s meeting rooms. And here is one planted outside a building that is used as a guest house and as a storage shed for peanuts. A place of clean water, a place where there will be shade and mangoes . 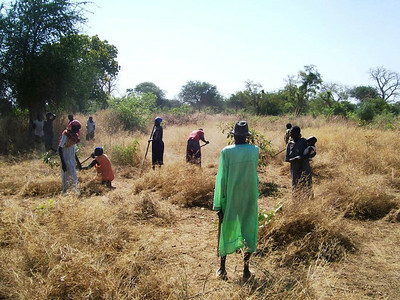 .. thanks to all those who have helped create this oasis in a remote part of South Sudan. Students in the women’s literacy class at Rhumathoi Community Center examine a corrected exercise book. 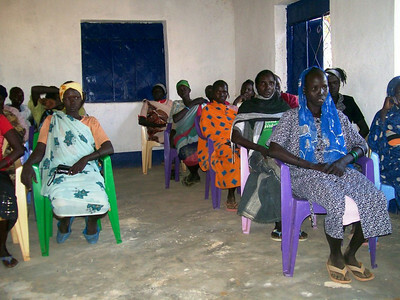 community center’s women’s literacy class. She also spoke eloquently how women, especially widows, were sacrificing their income-producing time (mainly gathering and selling firewood in the market) to go to class. And here she is (again on the left) in Ron’s post about the distribution of personal battery kits. I haven’t asked Angelina what she will do with her PBK, but I have a feeling that providing mobile-phone charging will be a part of her use. (South Sudan has leaped over land lines to cell phones. While I was there, people listened to the radio, stored music, and checked the internet on their phones as well as talked; mobiles are a valuable educational resource.) There’s a constant, growing market for charging phones. Through her connections with the community center, now Angelina has a potential source of income beyond gathering firewood. Way to go, Angelina! 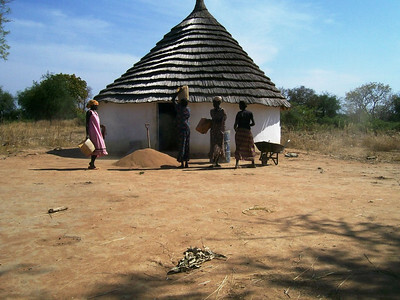 Villagers in an around our multi-purpose community center in Rhumathoi know just about everything about peanuts – or ground nuts, as they are called locally. They even know about crop rotation to control disease and increase yields. As a food staple in South Sudan, local peanut farming makes good business sense as well as a strategy to mitigate seasonal hunger. All the poor people of Rhumathoi needed was a small amount of start-up capital to buy the tools and seeds to get their business going. 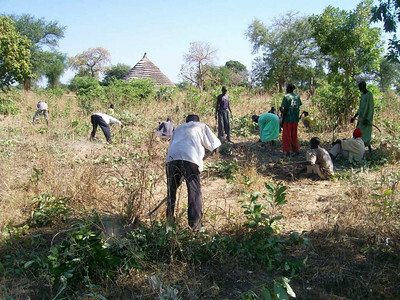 In yet another promising partnership between Village Help for South Sudan and local entrepreneurs and laborers, the Rhumathoi community center’s peanut business is now underway. The land shown here is generously donated to the Center for this year’s peanut farm. The exact size of the farm is hard to estimate, but the community elders and administrators are committed to giving as much land as needed to support this local business. Our contribution to the farm was a grant to purchase the tools needed to prepare the farmland and enough seeds to plant one acre. The woman seen here has just helped prepare the seeds for planting. Peanuts acquired locally – whether for seed or for meal consumption – need to be shelled by hand. The peanut shells are hard, and the shelling process is long and painful to produce enough seeds for a community farm. The one-acre peanut farm is expected to produce around 3,000 pounds of peanuts at harvest time. The community will sell their harvest in a shop in the local marketplace. This picture shows the plot that will be developed into the shop for the community center’s retail sales, featuring peanuts and other outputs from the Center’s programs. To anyone here in the U. S. where electricity is common, it is not unusual to see lights emitting from windows at night. 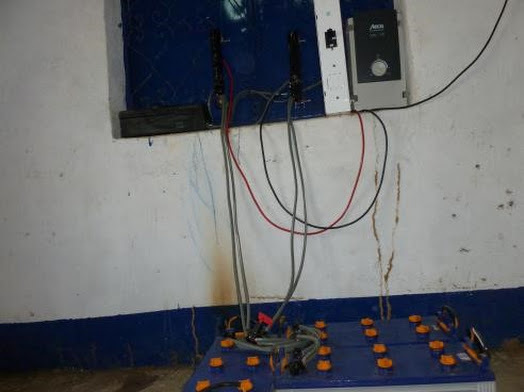 In rural South Sudan, however, electricity is almost non-existent, so these lights coming from our multi-purpose community center in the village of Rhumathoi, Wunlang Payam, are the cause of much excitement for all of us at Village Help for South Sudan. We celebrate Earth Day 2013 with clean energy and the benefits this brings to Rhumathoi – and the environment! With support from IEEE’s Community Solutions Initiative, the solar electric generating system at the center is now complete. This project not only provides lighting for the facility, but the system will be run as a small business by a community-elected energy entrepreneur who will sell electricity to rural homes at prices the local residents can afford. 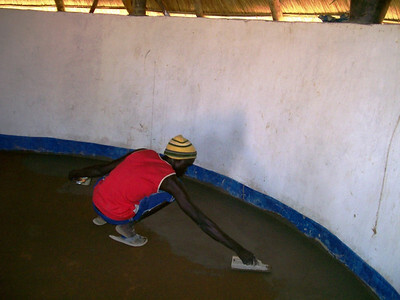 Proceeds pay the entrepreneur’s income as well as operations costs at the multi-purpose community center. 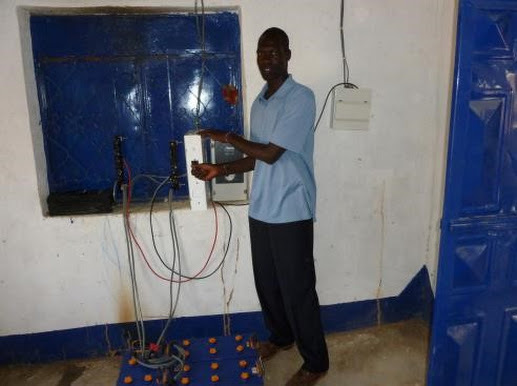 Mou Riiny, our electrical engineer, and his team completed a market survey several months ago to determine the price rural customers can pay for electricity. 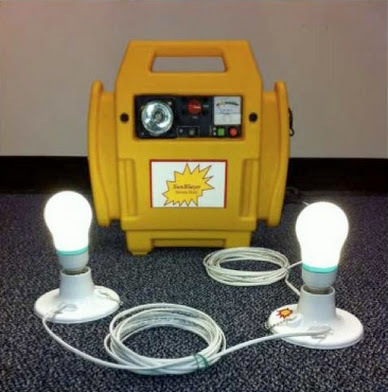 Residential electricity is provided in the form of take-home rechargeable battery packs and lighting kits (PBKs). The initial pilot will test a PBK from BBOXX which has similar operations in other countries in Africa. 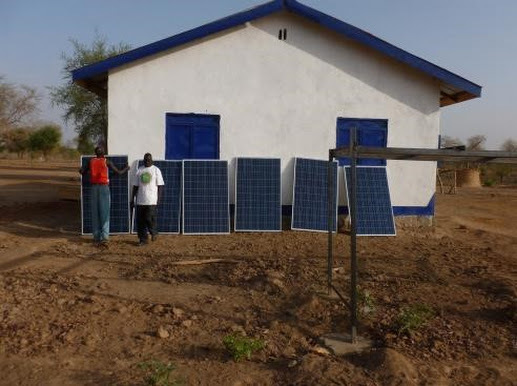 IEEE-CSI has developed an open-source design for another PBK (pictured here), however, and our goal is to set up an assembly plant in South Sudan to produce these units locally. Our solar business pilot aims to help Mou Riiny establish his for-profit social enterprise to be called SunGate Solar. SunGate will be owned and operated by Mou, and will provide jobs and opportunity to many of his fellow South Sudanese citizens. Mou’s initial solar project is now operating in the village of Thiou at our primary school for that area. Use the marketplace to solve pressing social problems. Have a primary purpose to do social good. Serve the common good, making money while solving social problems. Are values-led and committed to the triple bottom line of people, planet and profit. Use the power of business for positive social change. Believe the bottom line and social change can be hardwired together. Develop and sell products or services that address social or environmental issues. Are values-centered, transparent, and in business for the benefit of all stakeholders. Are dedicated to making a sustained, positive impact on social and environmental change. Believe what is good for the world is good for business. See more pictures from the solar installation at the Rhumathoi community center here. Here’s a slide show of our gift to the villages surrounding the Rhumathoi Community Center: two bulls and the feasting that followed. I had some of the beef. It was fantastic. So was the honor. When Ron left Rhumathoi, he announced that we were buying two bulls for a thank-you community feast. One morning during teacher training, all the students are looking out the window. . The bulls are being slaughtered. Class was recessed. When an animal is slaughtered for feasting, the Americans can barely look, but the South Sudanese make a point to document this important event. As the bulls were butchered, women prepared honorific scarves. All our women's-literacy teachers got honorific scarves. I was honored to get a scarf, too. Yel Maduok Ngor, our community-center manager, got money on his scarf! Then the meat was divided up. Each family group cooked its own share. Groups were spread all around the compound. The first to be served food in the community was a blind man and his guide. The second were the war veterans, including this soldier who gave his leg to his new country. There was no large organized group of singing and dancing, but small groups would break out under various trees. it was a wonderful, fascinating day. The women’s literacy classes turn out to say goodbye to Village Help for South Sudan director Lisa Deeley Smith. The center is behind the class. Mr. Deng, the headmaster of nearby Rhumathoi primary school, and two other teachers from the school lead the women’s literacy classes. A few women have had a little education and are starting with the South Sudan health curriculum for Primary 1 classes. (South Sudan’s curriculum is modeled Uganda’s and Kenya’s.) The majority of the women started with the ABCs; they had reached “U is for umbrella” by the time I left. Women’s literacy teacher Joseph Deng corrects a student’s exercise book. The students arrive in the afternoon early afternoon, work with one tea break (after they’ve finished the work in their exercise books), then begin the walk home around 5 p.m.
We are so proud of the women of Rhumathoi and the welcoming attitude of the community toward a women’s literacy class. Who knows how far they’ll go? News and pictures have just arrived about some exciting activity taking place at the multipurpose community center we are supporting for livelihood training and adult education. Community members are clearing the land where the center’s demonstration gardens will be planted. The purpose of these gardens will be to grow crops as a food source for the training program’s participants and to sell surplus vegetables and grains in the market. The agriculture class will also learn about irrigation methods to support dry season gardening. Our grant to the center has also enabled the community to hire a local teacher to lead basic literacy classes for adult women who have never had a chance to go to school. Functional literacy skills will supplement other training to enable partcipants to start and manage small enterprises, generating income to help sustain the center’s future operations and for modest personal earnings. Finishing touches are also preparing guest houses for visitors and staff who need overnight accommodations. The guest housing will be a comfortable place to stay and provide practical hospitality training for program participants. This small B&B will also generate income to support the center and pay the staff. Our visiting board members will be the first guests when we travel to the area in January. Looking at these pictures brings us comfort and joy knowing our donors enable us to support community initiatives in this way – local citizens doing their own development work!